The honed or satin finish of this veined cut travertine plank flooring was very muted and lacked luster, as you can see in the BEFORE image. When we saw this unique luxury travertine tile that looks like wood plank flooring, we couldn’t wait to get our hands on it. One of the most satisfying aspects of the work we do is envisioning a floor like this for its full potential, and then restoring it from its current condition to the stunning design statement it was intended to be. We needed to adjust our regular travertine floor restoration process, because of the unique qualities of these travertine tiles. First, we ran a soft stone antiquing brush across the floor with a salt based cleaner. 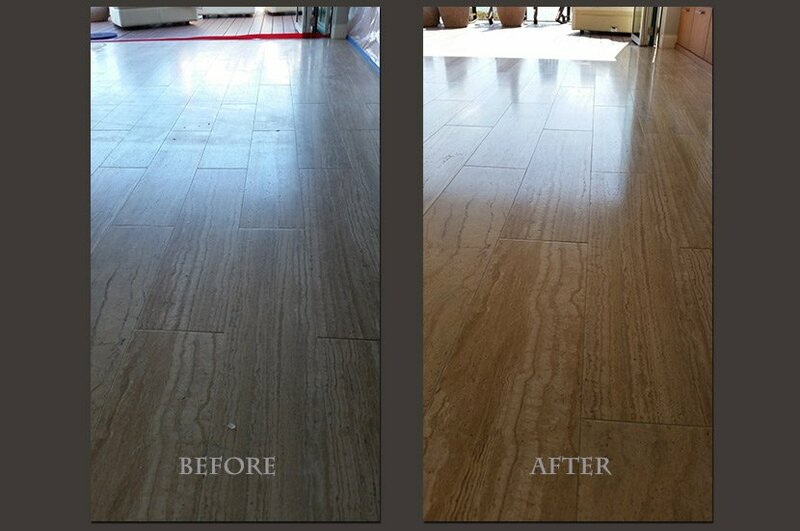 This process removed the dirt and grime and prepared the floor for travertine sealing. All non-polished travertine should be sealed, to protect the floor from stains. Once the floor was sealed, we invited our customer to admire the results — the floor was restored to a beautiful, better-than-new finish, highlighting the range of variation in color and shade, shown in the AFTER image. The homeowner commented that it looked better than the day it was installed! For more information about travertine restoration, such as etch removal, lippage removal (leveling uneven tiles), crack and chip repair, stain removal, sealing, filling naturally-occurring travertine holes, as well as honed, slightly polished, or high-gloss polished finish, watch one or more of these short videos: Floating Travertine, Travertine Strip, Hone, and Repolish, and Travertine Repair, Restoration, and Polishing or visit our Travertine Services page. 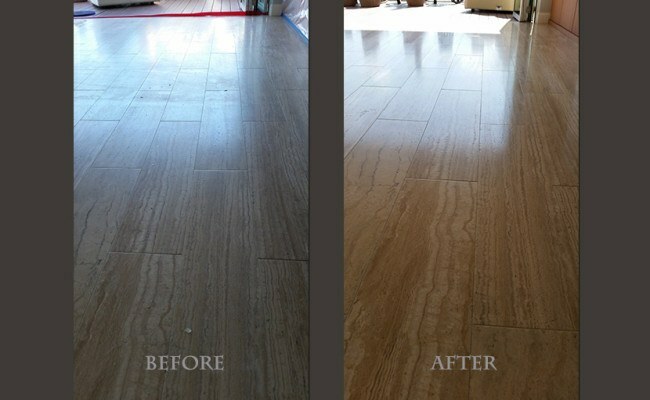 If live in the San Diego area and you need marble floor polishing, travertine floor honing, or any other natural stone repair, restoration, or maintenance, contact us online or call 619-246-0240 today for a free estimate.